Mallet finger is a common hand injury and involves the tendon that straightens the tip of the finger. This type of injury can occur when the tip of the finger is jammed, forcing it to bend quickly and forcefully. Banging the tip of the finger while simple doing everyday activities or having a ball hit the end of the while playing sports are common ways to cause this type injury. 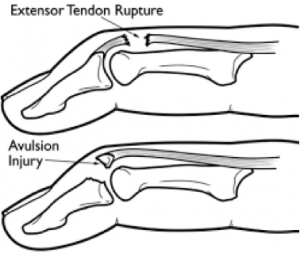 The forceful bend causes the tendon to tear away from the bone and in some cases may take a small piece of bone to break. Pain and swelling may occur, however the main symptom is the fingertip rests in a bent position and the person has an inability to straighten the tip. It is important to contact a hand surgeon following this type of injury. The success of treatment is typically better the earlier treatment is initiated. Treatment will depend on the severity of the injury. The injury may be treated conservatively with a small splint which positions the fingertip in a straight position. In some cases surgery will be recommended. Surgery involves a temporary pin to keep the finger straight. A small protective finger splint is also worn after surgery. Mallet finger treatment is typically successful particularly if treatment is started early. Without treatment, you will not be able to straighten the finger; sometimes further problems develop that make the finger even harder to use. It is important to seek treatment for this condition even if there has been a delay.